The opening event for the monthly Bronx Night Market took place Saturday, June 28th at Fordham Plaza. 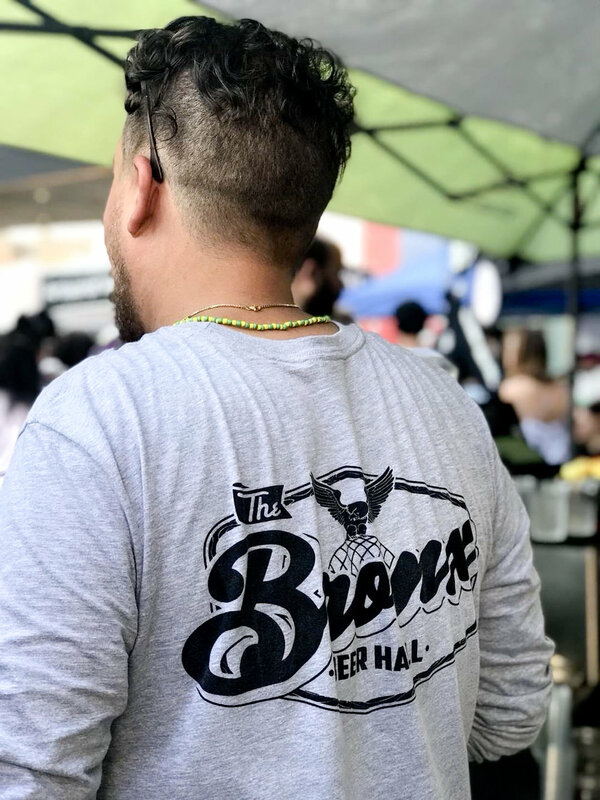 This free entry, open-air festival is a collaborative endeavor between Edible Bronx and BLOX featuring local artisans, merchants and music performers from throughout the borough, with some from across the river (we saw you Harlem!). With over 35 vendors in attendance on what felt like a record scorcher day, locals and those who braved non-air-conditioned subway trains (I invited two friends from Queens...their love was real!) had the chance to experience some of what makes up the Bronx’s thriving food culture. Popular vendor booths included Empanology, Next Stop Vegan, and The Bronx Beer Hall. Save for ice cream vendors Creme and Cocoa Creamery, Scoops In Cahoots, and my personal favorite, Tripla Panna Ice Cream, attendees enjoyed live musical sets from Anthony Anderson and DJ Bronxura and had the opportunity to purchase merchandise from local businesses such as The Bronx Native and The Tea Factor. I wouldn’t go as far to say that the market showcases all the diversity of food culture in the Bronx, yet I am excited to see what the vendor make-up of the market will reflect throughout the remainder of the summer. The size of this borough is awe-inspiring to me, and yet can often times overwhelm people and their perception of all the things the Bronx truly has to offer, including good food. As someone who has traveled more than an hour for a meal (and yes it was worth it! ), the Bronx Night Market, however, provides a unique opportunity to bring two important groups together: the Bronx consumer, and the Bronx business owner. It’s not uncommon for many Bronx locals to travel outside of the borough to satisfy hungry bellies and curious palettes, whether it be for Saturday brunch or a casual dinner date. With the majority of the borough working on the island, we forget that there is a trail of money that makes its way back uptown, eager to be spent on amenities such as wining and dining, as well as supporting all other things local. Bronx natives are hungry. We, too, like our Brooklyn and Queens brethren, like to eat, like to be able to spend our weekends close to home, like to be able to spend our money close to home. The Bronx Night Market serves as a reminder to consider all the options here within the borough before hopping on the subway to the others, to continue to give our home a chance and to push ourselves to be curious about what’s going on in our own backyard (or whatever is synonymous to a yard because I don’t know too many people who have front and backyards). The empanada sandwich from Empanology. If the turn out from the first event is indicative of attendance at future market nights, organizers may want to reconsider other location options! It was one of the few events I have attended this summer where I witnessed a merging of various Bronx communities in a single location. Of course, proximity to a major public transportation hub and subway lines contribute to Fordham Plaza being a rather reasonable setting, including its vicinity to local commerce along Fordham Road, Arthur Avenue roughly a ten-minute walk away, and nearby local attractions such as the Bronx Zoo and Bronx Botanical Gardens. One can make a whole day’s outing simply touring along this main strip. In any case, I reserve whatever criticisms I have, as this effort to unify the Bronx community through the celebration of food and local artisanal and entrepreneurial commerce deserves an applause. If you missed out on the opening event, be sure to be there on July 28th at 1 Fordham Plaza. Remember: support local, but more importantly, support home. A Hidden Gem in Parkchester: Ayo Ajo y Orégano! I have a tendency to be a creature of habit, especially when it comes to things I love, like travel, food, Netflix/Hulu binges. With food, it’s one of those things that has the risk of being boring very quickly: the same flavors over and over again, the same textures, ingredients. Very few cuisines rock my fancy much. In practice, I like to adhere to what I call my “Triple M” rule: Mediterranean, Middle Eastern, Mexican. I can eat these meals forever and never grow weary of them. I’m not an active cook (please don’t ask me to meal prep! ), but as of late, with the demands of my job intensifying with every passing work week, I have to admit, I’ve found myself okay with being that bachelorette forking over all of her money to the god of Seamless…and Grubhub…and UberEats...basically anyone who will bring food to my apartment door and accept me as I am in my frog house slippers and Syracuse sweatshirt sans makeup. I’ve lived in Parkchester for almost three years. I wouldn’t call my section of White Plains Road a food desert, but I’m not sure how many Mexican and Chinese restaurants one really needs a block from each other (note: this is not a complaint!). In fact, for the longest, I sort of avoided most spots near my house, scouring and scavenging for good eats closer to Little Italy or even going as far as Riverdale as these areas were often perpetrated as prominent “food hubs” in the Bronx. I’ve gotten better at exploring neighborhoods in the East Bronx: Van Nest, Morris Park, Westchester, and some of Throggs Neck and Castle Hill. I have every intent of exploring them all to the fullest extent, but with all these nor’easter storms trick or treating the east coast all winter long, I have risked going hungry to avoid braving the elements, even to go around the corner. On one cold afternoon, my hunger got the best of me and Seamless had the nerve to threaten me with a 45-60 min delivery wait. I was reluctant to travel far. My makeout session with Netflix was getting hot and heavy (going on hour four), but I figured I’d give the outside world closest to my front door a chance. Nearing the corner of White Plains and Guerlain, I quickly flipped through a directory in my head of some local spots near me: North bound, “Oasis”, “F&J Pine,”“La Masa,” South bound, “Taqueria Tlaxcalli,” “Al-Aqsa Restaurant,” “Step-In.” As often as I frequent these spots, I really wasn’t in the mood for any of them. Standing at the corner, sandwiched between a tire shop and a barber shop, I spotted a restaurant I pass every evening on my way from the 6 train, “Ajo y Orégano.” I remember trying their food back in November and liking what I ordered. I figured it couldn't hurt to try them again. Upon entering, my glasses immediately fog up. The place was small yet packed. The line stretched from the central hot line counter all the short distance away to where I stood near the front door, roughly ten feet. I was practically leaning on a patron seated at the table next to me. I stood quietly, taking in the bright decor of the green walls and paintings around me, eyeing food being delivered to the four tables that made up the small dining space while I inched my way towards the front. For how tight it was, it was incredible to not hear a single person complain, groan, or grunt while waiting for their food. In fact, everyone waiting in line stood in remarkable peace and patience. The turnaround was quick for both take out and sit down orders. When I finally arrived at the front of the line, I ordered what I had last time (and what I have been ordering ever since! ): rice and beans, maduros, and stewed chicken. I was in and out in ten minutes (take that Seamless!). Once home, I sat on my couch and silently devoured one of the best take out meals I’ve had in a long time. I ate everything but the tin take out container. Ever since that afternoon, I have devoted ten minutes of my Saturday afternoons to stand in line for their food and have not regretted a single minute (or dollar) spent. Ajo y Orégano has only been around for roughly four months, but one wouldn’t assume such based on the level of traffic this family owned restaurant seems to muscle through every weekend. Owned and managed by brothers Enver Perez and Jeudy Alexander, Ajo y Orégano has attracted a strong following. With over eleven thousand Instagram followers, the restaurant draws in people from all over the city, including patrons from New Jersey, Pennsylvania, and Connecticut. This success was not an immediate reward. The restaurant originally started as a meal prep service, Slim-to-Go. The initial business struggled with typical issues for a startup food service company, including implementing an effective marketing strategy. Others made their way from just the other side of the Bronx, having discovered the restaurant reposted on a Dominican food Instagram page. “From there, I just started following them, and I [saw] how close they were from us, from where we live,” stated one patron. “There are Dominican restaurants everywhere, but it’s hard to find a good one around here in this area.” His companion went as far to even take note of the restaurant’s hygienic measures compared to other establishments she’s visited, how just their constant use of gloves and keeping their hair covered provided her a level of comfort and appreciation for the food. “I think it’s really popular because of the way they serve it, because [the food] also comes in those little [decorative] pots. The pots which she referred to have become a distinctive trademark for the restaurant. These colorful hand painted metal pots portray a snapshot of the Dominican Republic countryside; pastel colored houses posed next to vibrant trees with the name of the restaurant scripted across the top edge. Of course, it is the food that keeps bringing people back. During its peak on a weekend, roughly three to four parties can be witnessed waiting outside to be seated inside the restaurant. “I think the biggest compliment for us here,” said Enver, “is when people say ‘I want to bring my mom’ or ‘I want to bring my grandma’. Because they want to get it passed them, they want to make sure, like ‘Mom, this is official right? This is authentic, right?’”, he laughed. Enver seemed to empathized with this feeling all to deeply. He witnessed one of his favorite spots, Malecon, which he frequented with his own mother, almost get pushed out due to gentrification. However, because of the loyalty and love for the restaurant and its owner, local neighborhood members rallied together and paid for the restaurant’s rent, “because they didn’t want to lose that spot,” he added. It’s worth noting that all the while throughout the interview, the restaurant remained steadily busy, Enver working alongside his brother Jeudy, both manning the hotline, taking to-go orders, delivering food to tables, pausing every now and again to answer my questions and share with me their story as a family owned restaurant. A number of close friends and cousins also worked in the kitchen and prepped food. And lastly, their own mother provided her time and energy to being both a server and a cashier for the restaurant. It goes without saying that the coziness, the intimate environment, and the delicious food, are a reflection of the family who put in their time and hard work. It’s a small space, but its homestyle Dominican cuisine can make anyone feel like at home next to a complete stranger. Though only four months into it, Ajo y Orégano has the air of having been a neighborhood hot spot for years. The restaurant will see it’s first summer season this year, and plans to expand and meet its ever growing fanbase will allow for many more Bronxites to come and experience them. In the meantime, I recommend everyone take a pause from their respective binges and checkout Ajo y Orégano. I promise you won’t be disappointed, and I guarantee you’ll find yourself back there again and again as I am every weekend. I smacked the back of my spoon on top of my crème brûlée, revealing the basil infused custard lying beneath its torched surface, it’s aroma incredibly charming. I was already full, but I'm not one to turn down dessert. I took a spoonful. "Oh my goodness," I moaned loudly, leaning all of my weight from tonight’s dinner into the back of the chair. My friend who sat across from me looked up from her spoon and laughed. We couldn't understand how we were in an Italian restaurant in the Bronx and NOT on Arthur Avenue, for me, the two is seemingly synonymous with one another. This association was surely challenged by tonight’s adventure in the South Bronx to Porto Salvo on 161st between Melrose and Elton Avenues as part of “Savor the Bronx” restaurant week. Upon seating, I quickly took stock of the space around me: seahorses, low hanging lights, white tiles and wood lining the bar and walls. A boat steering wheel hung on the far end of the bar. Behind it hung a captain’s hat. The nautical décor transports one to an old Italian port tavern to which the restaurant derives its interior. The ambience was relaxed. It was something I found myself taking note of repeatedly: how comfortable I was, how comfortable everyone around me seemed to be. It was a relatively busy night for the budding restaurant, shy of being open only five months. We sat next to a table of about eight, a good-humored and lively group, but I was able to hear my friend clearly as if she were sitting right next to me. For the most part, patrons appeared to be locals. The restaurant stands alone on the block, save for a deli at one corner, and a fresh foods market and an African market sandwiching both sides of the restaurant. Service wasn’t rushed, which I typically prefer. I’m not one to want my meals so quickly, especially multiple courses. It helps to appreciate the full culinary experience of a home cooked meal coupled with the intimacy of enjoying good conversation and several glasses of wine in between. From my experience, this also tends to be typical of most authentic style restaurants where one can be assured that their food is prepared fresh and made to order. This is an important fact. To live in one of the most incredible, diverse cities in the world, as much as I love to eat, I am hungrier for an experience and I don’t always want to swipe my Metrocard and leave the mainland behind in search of it. Call it Bronx pride. Heck, call it sheer laziness, I wouldn’t be entirely offended, but one thing I do know is that I can have both a good meal and the experience of fine dining right here in my home borough. “Savor the Bronx” restaurant week afforded us the opportunity to enjoy a three-course old Italian style cuisine meal for only $35, which included a glass of their house wine. I started with their homemade crab cake served over cauliflower and string beans with a light white drizzle sauce, my friend enjoying their Bruschetta Funghi e Fontina (mixed mushrooms, fontina cheese, and truffle oil over toasted peasant bread). For the main course, I had their homemade ravioli with sausage and potatoes with a rosemary sauce (an incredibly aromatic meal!) while she had the grilled salmon with string beans, roasted tomatoes and potatoes. Portions sizes of both of our appetizers and main courses were impressive and we find ourselves full rather quickly and taking leftovers home. Of course, saving enough room for dessert. These “compromises” shouldn’t have to come at a cost of living in the Bronx. Bronx pride is strong, and real! And anything that deepens this emotion is worth proudly representing, Thankfully, places like Porto Salvo are an important reminder on all that our borough has to offer, specifically to its locals. We can begin to abandon the idea that we need to travel into Manhattan for a good meal and great drinks. Instead, we can invest in exploring the open seas that is our home borough and discover new places to drop anchor. With a well-stocked bar featuring local draft beers, a variety of wines, and a menu full of authentic Italian cookery made to order at an affordable price, and most important, the feeling of being home, I wouldn’t be surprised if Porto Salvo becomes a frequent weeknight hot spot. And knowing that they offer brunch (with outdoor seating, sch’mon summer! ), I wouldn’t be surprised if I find myself pulling into port and dropping my anchor again and again. There is an oasis in the Bronx that you may or may not have heard about yet. It is bright, welcoming, and well designed, and I am basically going to spend the entirety of this article singing its praises. Have I mentioned they make an extraordinary cup of coffee? Before I praise on, let me first give a little context. Those close to me know I have a deep love and respect for small businesses in the Bronx. I think it takes an incredible amount of strength, stamina, grit, and vision to operate a small business amidst the myriad of challenges plaguing most commercial entities in the borough (and New York City, at large). But when I stumble upon a business that provides me with a transcendent, one-of-a-kind experience, my love often evolves to obsession. You can tell a lot about a space by how it is designed and what it makes you feel. Though I am not a trained interior designer or architect, it was clear from the moment I walked into The Miles Coffee Bar --- or “The Miles” to use its nickname --- that a lot of time, inspiration and care went into the construction and design of the space. The Miles Coffee Bar opened a few weeks ago on East Tremont, near the corner of Miles Avenue. Working closely with Jenny J. Norris Interiors, Miles’ owner, Mario D’Agostino, has created a balanced atmosphere flooded with natural light, clean lines, and thoughtful furnishings. Visual elements such as a mounted wooden bookshelf showcasing a set of carefully curated books, a tasteful variety of houseplants, and a custom made sign with the business’ name, round out The Miles interior aesthetic. And soon, The Miles’ customers can look forward to their beautifully built backyard space opening soon, which will feature a large communal table and a stadium-style wooden bench seating area. The process of actualizing Norris’ and D’Agostino’s vision for the space was hard won. According to D’Agostino, It took their team nine months to renovate the space, which operated for decades as a barbershop until the previous owner's retirement last year. The best part of this is the response from the neighborhood. I’ve always loved the Bronx and I have no interest in leaving the Bronx and I am glad I could bring something here people want.” - Mario D’Agostino, Owner, The Miles Coffee Bar. As I have come to learn to be a common trait among many Bronx food businesses, there is a wonderful story about how D’Agostino came to open and operate The Miles. Seven years ago D’Agostino opened the Muscle Maker Grill, a healthy fast food chain, next door to the space The Miles now occupies. His years of managing Muscle Maker, combined with his over fifteen years experience working in the restaurant industry, influenced D’Agostino to become acutely passionate about the quality and freshness of the food served at The Miles. Each morning, the knowledge and talented staff at The Miles bake and prepare everything they serve (except for the bread on their sandwiches, which is delivered fresh from a purveyor in Hunts Point). Their food menu is small but varied, and, to the delight of many with dietary restrictions, includes many gluten free and vegan items. When I first opened Muscle Maker seven years ago, I didn’t know I would be one day opening a coffee shop.” - Mario D’Agostino, Owner, The Miles Coffee Bar. But, as you might expect from The Miles’ full name, the real star of the show is their coffee. However, don’t expect to find any snobbery here. 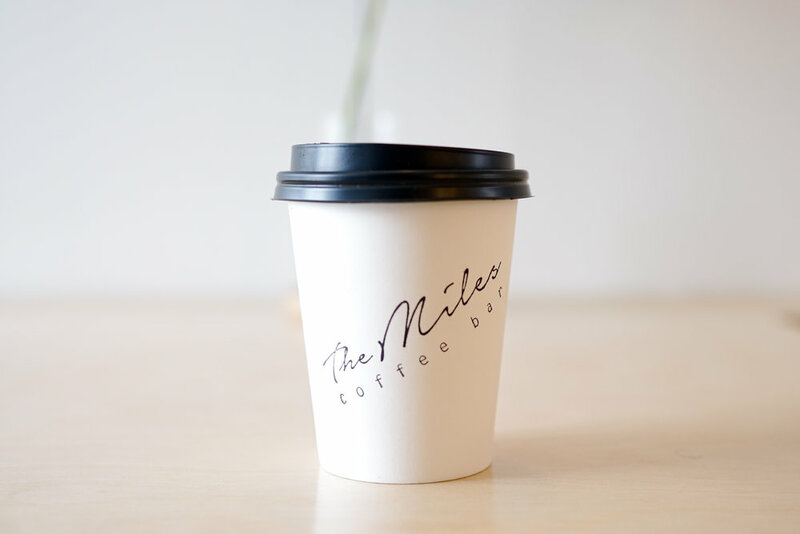 The Miles’ is serving up some of the freshest, smoothest, coffee in the Bronx, without a hint of pretension. Overall, D’Agostino and The Miles staff’s genuine love of coffee and commitment to quality is reflected in every cup they pour, manifesting in an experience chock full of robust flavor and taste. As if there wasn’t enough to be excited about already, D’Agostino has his eyes set on the future growth of The Miles. He is currently waiting for approval on a license to serve beer and wine, and when that happens, the business will add additional evening hours so people can join them after their current 8:00 pm closing time. D’Agostino also hopes to host future events featuring the many talented visual artists, makers and musicians in the borough. He has already met many through managing The Miles’ social media and, on a recent Saturday, invited Joseph W. Gonzalez (a.k.a @theBXBarista) over to serve as a guest barista and showcase his “latte art”. All of this gets to the heart of the vision D’Agostino hoped to actualize in the first place: to make The Miles an authentic community space where people could not only meet one another, but actually connect with one another (over a great cup of coffee, of course). The Miles Coffee Bar is located at 4039 E Tremont Avenue (between Gerber Place and Miles Avenue) in Throggs Neck. You can find out more about the business on Facebook and Instagram. Meet Alexis Faraci of the Bronx Baking Co.
One of life’s great mysteries lie in the possibility that just one conversation or interaction can take us down an unanticipated path, forever changing the trajectory of our plans. It was one such serendipitous moment that led Alexis Faraci, owner of the Bronx Baking Co., to specialize in her company’s signature product: hand-rolled German style pretzels. Four years ago, Alexis founded her wholesale enterprise on City Island. Though the company initially offered a wider variety of products, the decision to focus solely on their now popular line of German style pretzels came after a fortuitous conversation Alexis had with a friend from Germany, who stated he could not find a good pretzel in New York and recommended she try making one. Not one to turn down a challenge -- (meet her and you will instantly see her spirited demeanor) -- Alexis went on to do the arduous work of researching and creating the company’s signature recipe. Bronx Narratives on location at the Bronx Baking Co.
Steeped and committed to the research process, Alexis first went online and found German recipes that she translated into English. She then made spreadsheets, noting unique variations and possibilities. She even traveled to Germany with the sole purpose of shadowing and working alongside local bakers. In the end, Alexis tested out everything she learned, soliciting ideas and feedback on each iteration of her recipe from family and friends. She took detailed notes and continued adjusting until she came to create the base recipe used in all of the Bronx Baking Co.’s products: a mixture of high-gluten flour (which gives the pretzel its chewy consistency), yeast, flour, water, sugar and salt. The ingredients are mixed into a dough which is cut, hand-rolled and dipped in a lye bath before baking. Every pretzel made at the Bronx Baking Co. is finished by hand by one of the company’s trained bakers. “I can’t figure out how to take the hands out of the process and maintain the quality, so it will be done like this forever.” - Alexis Faraci, founder and owner of the Bronx Baking Co. But the happenstance and hard work surrounding the Bronx Baking Company’s story doesn’t end there. In fact, the past four years of the company’s growth could easily be classified as a quintessential Bronx tale. Just as Alexis began shifting the company’s product line to focus solely on pretzels, the craft beer movement was taking off in the Bronx, with ventures like the Bronx Brewery opening up. Looking to meet the projected growth and demand for its pretzel products, Alexis sought to relocate the company’s production facility to the South Bronx, where she also happens to live. For months she discussed her need for a new commercial space to operate out of with everyone she met. And, with help and advice from another Bronx business owner who operates a restaurant near her apartment, Alexis found her company’s current location: a spacious, sunlit commercial loft space in Port Morris. The power of Bronx networking: “One day I came out of my apartment and Amir said ‘I found your bakery!’” - Alexis Faraci, founder and owner of the Bronx Baking Co., on how Amir Chayon, co-owner of Ceetay, helped her find the Bronx Baking Co.’s current production location. Some might say that Alexis was always meant to open up a business in the Bronx. Though she grew up in Westchester, she has a long history in the borough: her mother spent years working at Evander Childs High School and other schools in the area, and her Italian-American family still resides in the house her great-grandparents bought long ago on Arthur Avenue. Her deep roots and hard work have helped her establish the Bronx Baking Co. among a long-standing line of bread companies in the borough, many of which have been around for generations. The Bronx Baking Co. is a wholesale company (i.e. you can’t randomly walk into their space and buy a pretzel when you’re craving one). Their pretzels can be found at local businesses such as the Gun Hill Brewery and the Bronx Brewery, as well as several establishments throughout the five boroughs. You can also purchase the pretzels online, where they can be mailed or delivered to you. “Germans use pretzels as a regular bread and we don’t think of pretzels as a regular bread. So sometimes people are like, ‘Oh, you make bread?’ and I say, ‘Yeah, pretzels.’ - Alexis Faraci, founder and owner of the Bronx Baking Co. If you have had a chance to check out the Bronx Baking Co.’s social media feeds, you will see that Alexis and her team spend a lot of time crafting creative pairings for their products. That’s because their pretzels can go with just about anything. It’s no secret that the South Bronx is the poorest congressional district in the country or that our borough, as a whole, is often viewed as the “gutter.” Recently, however, we were named the unhealthiest county in New York for the seventh year in a row - which is why we have decided to do a three part series on healthy eating and living in The Bronx. According to a recent Daily News article, “The Bronx ranked at the bottom for quality of life, which included poor physical and mental health and low birth weight, and in health factors, such as smoking, obesity, and physical inactivity” (Cutler, 2016). For the next few months, we will share some of the issues Bronx residents face with healthy living, why we continue to be the unhealthiest borough, and the steps we can and will continue to take as a community to resolve it. Disclaimer, I am not a professional health expert and will only provide a perspective based on research and my personal experience of growing up in the Bronx. As a child, healthy eating was not really a priority in my life. My family’s main concern was affordability and accessibility, so we made ends meet with the little money we had. Unfortunately, the same also goes for a lot of my peers - as well as, the children growing up in today’s society. I do not entirely fault them, nor their parents. Our neighborhoods are drowned in fast food chains like McDonalds, Popeye’s, or Burger King. As far as we’re concerned, “we’re getting our money’s worth and putting food on the table.” It’s quick, easy, affordable, and filling. Our attitudes may be different, though, if we truly understood that we are doing more harm than good to our bodies. We must realize that a healthy lifestyle isn’t only for those who can afford it. Those of us in impoverished communities also have options. In order to come to this realization, more people need to be educated on these topics. As adults, we do have a responsibility to educate ourselves and our families on healthy eating, but we should also be provided with the basic tools necessary in order to do so. In communities like the South Bronx or Norwood, we are often overlooked and sometimes isolated, which hinders us from being fully aware from the health disparities we face and the initiatives we have to help change this epidemic. The importance of healthy eating and living is not at the forefront of our minds partially because we are not actively exposed to these practices in the same way we are to our local high school star athlete or a crime on the front page of the newspaper. Initiatives such as the Montefiore Health System Program, Bronx Borough President’s Not 62 initiative, or Senator Gustavo Rivera’s The Bronx Can Health initiative aren’t heavily promoted or barely even recognized by many Bronx residents. Outside of these limited community based initiatives, there aren’t a wide number of health-based organizations that actively seek to educate Bronx residents in the same manner fast food restaurants consume our communities. In a 2015 press release, health commissioner Dr. Mary T. Bassett stated, “The health disparities that arise in the Bronx are a reminder that we need to do more to address the health needs of populations that face the most significant social, economic, and health challenges” (Lewin, 2015). Misconception and unawareness are some of the key attributes that contribute to an unhealthy Bronx. Some of us have a perception that a healthy lifestyle is expensive and others simply may not be aware of healthier food options. As a community, it is our duty to encourage others to live a healthy lifestyle and break the chain of childhood obesity, low birth-weight, and physical inactivity amongst other health disparities we face in our borough. One’s geographical location or finances should not determine one’s physical and mental well-being, but this is a sad realization in our borough and other communities like ours that must be addressed. Next month, in part two of the series, we will speak directly with Bronx residents of various communities of the borough to share their personal thoughts on healthy eating and living. In the meantime, you can check out a few healthy establishments in our borough such as Healthy Fresh, Juices for Life, and Vegans Delight. From a very young age, certain traits are instilled within us that pave the way for whom we will become. Whether it's from family, friends, or just by observing. Al Jallow, owner and chef of Fine Food Cuisine in Morris Park, can attest to this. Growing up in his hometown of Gambia, Al envisioned what his life would be like in the future. His mother, although unaware at the time, would gauge his interest as he watched her prepare dinner many nights. His father then showed him the ways of becoming a businessman. The combination of these two sides of life became important to who Al would grow to be. His journey began in 1999 as a dishwasher for a small restaurant downtown. Soon after, Al was given the opportunity to become a chef. It was at this moment that Al truly fell in love with the culinary world. He went on to work for a host of various restaurants including Bolo, which was owned by a legendary Iron Chef: Bobby Flay. Fast forward nearly two decades and now Al is the proud owner of his own restaurant in the Bronx, Fine Food Cuisine. Dondre had suggested Al’s spot to me on numerous occasions, making the claim that they make the best jerk chicken in the Bronx (don't let his Mom find out he said that). On a recent day, we finally headed over together and it's safe to say that this place did not disappoint. They have it all. Pizza to ribs, nachos to chili, and tacos to paella. The menu is sure to fill anyone’s craving. The place was a little packed when we visited, which did result in a longer wait time. However, that disappointment didn’t last once our food arrived. We started with Voodoo wings as an appetizer, and were reassured the wings had nothing to do with actual voodoo (phew). For my entree, I tried the panko chicken with macaroni and cheese and string beans. Dondre had jerk chicken, mac and cheese, and tostones. Their wings are covered in a “secret sauce,” Al’s very own recipe. It was like no other - sticky, sweet, and just a little kick of spice. It was an explosive combination of flavors that were highly enjoyable. The panko chicken was cooked to perfection, but the homerun was the mac and cheese. It was so velvety, almost to the point where Webster's dictionary might want to update the definition of velvety and make it Al’s mac and cheese. Dondre thought the jerk chicken wasn’t as spicy as he had from here prior, but it was still flavorful. He also thought the tostones were nice and crispy, while the mac and cheese also hit the spot. Towards the end of our meal, management did come out and apologize for the wait time and assured us that this never happens. Our experience at Fine Food Cuisine was very enjoyable. The food was great and management was great. Throughout all the bites was a well crafted playlist that included my favorite song “Brown Eyed Girl.” What stuck with me were the words uttered by Al, “I just want to do good work.” This man is all about giving back. He teaches in his spare time at a mosque and is working on ideas for Fine Food’s one year anniversary. Its safe to say that I’ll be returning for some Voodoo wings really soon. Hector's Thoughts - 4 out 5. The service on the day I went was just a little too slow for my liking. Food was great but the wait kind of took away from the experience. Six chefs, all Bronx based, recently joined forces and all for a good cause, promoting healthier lifestyles within our community. Rebecca Scott of Sustainable Snacks, Linda Kim of Pulse Foods, Tito Dudley of Simple Eats, George Carney of Poor Man's Kitchen, John Crotty of Bronx Hot Sauce, and Dan Hildebrandt of Uptown Roasters together created Bronx Box, a box of various artisanal snacks that are all prepared and sold out of our borough. Founded by Rebecca Scott, it was her passion for helping others live a healthier and more natural life that inspired her to launch the Bronx Box initiative. Originally from New Hampshire and a recent local resident of Guyana, Rebecca made the life transition in 2013 when she accepted a position at WIC, a special supplemental nutrition program for women, infant, and children, in the Bronx, managing their social media page. It was also around this time she rented a spot in WHEDco’s Bronx Cook Space to begin making Sustainable Snacks. Bronx Cook Space is a commercial kitchen located near the Grand Concourse section of the Bronx as part of WHEDco, a Women’s Housing and Economic Development Corporation that promotes healthier and vibrant communities.They officially launched in 2010, after acting as a food service program for the community they decided to open the space for chefs, caterers, and cooks who were all Bronx based. But it was personal trials and tribulations that really formed the heart of Bronx Box. “Being a cancer survivor has inspired me to pursue fitness, nutrition, and the culinary world by becoming a chef. I thought this was a great opportunity to spread the awareness about health in a borough that is often overlooked,” mentions Tito Dudley of Simple Eats. Founder Rebecca Scott’s auto-immune condition also pushed her to live a healthier lifestyle, change her diet, and start to do yoga. After she realized this lifestyle change made a huge difference in her overall health, she was inspired to relocate and help others live healthier lives without the pressure of taking prescription medication. Each of these individuals share a personal story with the Bronx and with the space. Their love for healthier foods and the borough brought them together to create this box in which each of their snacks were included based on Valentine’s Day themes created by Rebecca. There are three types of snack boxes that host a different theme to align with Valentine’s Day, Warm Your Heart, Healthy Heart Box, and Burn Baby Burn. In the Warm Your Heart box you will find a south bronx coffee blend from Uptown Roasters and a cinnamon simple syrup from Poor Man’s Kitchen. In the Healthy Heart Box, which is closely tied in with February’s National Heart Health Month, you will find a Dark Chocolate Nut Granola from Simple Eats, a vegan dark chocolate from Pulse Foods, and cranberry and blueberry morsels from Sustainable Snacks. Last but not least, the Burn Baby Burn box will include spicy flavors including Bronx crafted hot sauce from Bronx Hot Sauce, spicy lemon zest roasted chickpeas by Pulse Foods, and smoky maple pecans, as well as, spicy cherry morsels from Sustainable Snacks. The Bronx Box is currently available for purchase on Farm to People and they will continue to sell the products on a monthly basis as a different theme will be provided but Rebecca hopes to expand the concept of Bronx Box in which it will be made available in storefronts all over the Bronx. Each logo was handcrafted and designed by Katherine Hill. Love and togetherness is definitely in the air so check out the Bronx Box online or feel free to contact any of the collaborators for more details. Very often, we dream of making a change. Or even just stepping out of our comfort zones. But how many of us can actually say we have put aside our fears and took a leap of faith, not knowing what the future may hold? Ramessis Aponte is someone who can attest to the power of doing so. A Washington Heights native whose love for the food and beverage industry bypassed her career as a psychologist, Ramessis made a major change in her life in 2009 when she decided to leave the psychology field to pursue her dreams of owning her own business and opening a restaurant. In the years to come, Ramessis would begin saving for what would be her lifelong passion and soon watched all of her dreams come to fruition. Mon Amour Coffee and Wine, a French inspired coffee shop, launched its opening two months ago in the Riverdale/Kingsbridge area of the Bronx. Located at 234 West 238th Street, Mon Amour is surrounded by blooming businesses including Edible Arrangements, BJs, and Bronx AleHouse amongst others. “There are no other coffee shops here. We wanted something different, something practical. You’ll find Spanish restaurants and bars, but no coffee shop. Nowhere for our locals to come and unwind after a long day of work,” Ramessis explains. And this is true, as the recently opened coffee shop has already gained an array of loyal customers, including a young girl who yelped at the idea of going to a French inspired coffee shop, so much so that she wore a red beret to fall in line with the theme of Mon Amour. As Dondre and I enjoyed apple cider and lattes, we also couldn’t help but notice the vast number of customers that frequented the shop on a Wednesday evening. Ramessis shared with us the story of how Mon Amour came to be and some of their future plans for the shop. Ownership is shared by Ramessis, her husband (Ernies Alemais), and their business partner Jeff Garcia. Jeff, who has been childhood best friends with Ernies since attending John F. Kennedy High School together, already owned the space. However, it was not until Ramessis proposed the idea of turning the space into a coffee shop that they began the blueprint for what is now a special rarity in the Bronx. The inspiration behind the shop was people’s love for coffee and wine, along with wanting to bring something that hasn’t been exposed in the neighborhood. When asked what “Mon Amour” stood for, Ramessis said, “people love coffee and people love wine, so ‘my love for coffee and wine.’” She emphasized she felt there were not a lot of places where people can unwind and feel at home without having to head all the way to the city or dealing with the hustle and bustle at bars. “The idea of pairing coffee and wine caters to your morning people and your evening people,” she added. To stand true to its name, the ambiance was immediately felt upon entry with brick covered walls, the sound of soft music filling the intimate space, and the smell of pastries filling your nostrils. The bright lighting and couch like seating made the shop feel very homey, not to mention a slight division where one half of the shop resembled a living room and the other half a kitchen. Our server wore a black and white pinstriped shirt, with a red necktie, in true Parisian spirit. For a brief moment, we left Kingsbridge and arrived at Rue de la Rouquette. Some of the Pastries include an assortment of macaroons, cookies, muffins, and my personal favorite: the almond croissant (ask them to warm it up!). If you’re craving something heartier, they also offer grilled Paninis and various sandwiches. As a drink, I opted for the warm apple cider, which was nice and hot but not overly sweet. Dondre went with the Vanilla Latte (a personal favorite of his). For all of my wine lovers, the shop will begin serving an array of red and white wines in the coming weeks, so by the time you make your way there it should soon be ready for serving. To top it off, the service was impeccable as they treated us with the same attention one would receive if we were in a four star restaurant. The minor details, such as stopping by our table to bring extra Nutella or checking to see if our drinks were to our liking, really stood out to me. For a coffee shop, they sure knew how to make their customers feel warm, welcomed, and extra special. Way to go Ramessis, Ernies, Jeff, and the entire family at Mon Amour! We fully support your endeavors and enjoyed our time spent at Mon Amour. This is only the beginning of a budding relationship. Coda’s Corner – 5 out of 5 stars especially for service and hospitality but primarily for the vision. Ramessis’ story serves as an inspiration to all those who have a dream and want to fulfill it but are afraid of taking a leap of faith. Mon Amour Coffee & Wine is located at 234 W 238th st, Bronx NY, 10463.